GRUPO GAVIOTA, operating under the brand: Via Transgaviota. Click to see a car rental price list (2015). There are car rental offices in most hotels in Cayo Santa Maria, and also at the Santa Clara International Airport (Aeropuerto Abel Santamaria). To rent a car or jeep you need to show your driver's license (from your home country) and your passport (a photocopy is usually sufficient). For a car or jeep you are required to put down a deposit (usually 200-250 CUC) either in cash or in the form of a credit card hold, until you return the vehicle. To rent a scooter you need only your passport, and to rent a bicycle they usually ask only for your name, hotel, and room number. Note that in every resort in Cayo Santa Maria, bicycles are no longer part of the all-inclusive package. Bicycle rental centers ($) are located within the commercial centers called Pueblo (aka Plaza): Plaza La Estrella, Plaza Las Dunas, and Plaza Las Terrazas. Expect to pay around 55-60 CUC per day (75-80 CUC on major holidays) for the smallest manual transmission car, and around 45-55 CUC daily on a 3-days or more basis. Luxury cars and automatic transmission cars (harder to find) can starts at 80+ CUC per day. Insurance is mandatory and costs 15-20 CUC per day (depending on model). Cars and Jeeps are usually rented with a full tank of gasoline and you must return it full. Price for gasoline is approximately 1.20 CUC per liter for Regular, and approximately 1.40 CUC for "Gasolina Especial" (often required on rental contracts). Many rental offices, especially the ones located in the hotels, may give you a price which includes insurance and a prepaid tank of gasoline, in this case expect to pay around 120 CUC for 1 day (60 for rental + 60 for insurance and gas), or around 240 CUC for 3 days (150 rental + 90 for insurance and gas). 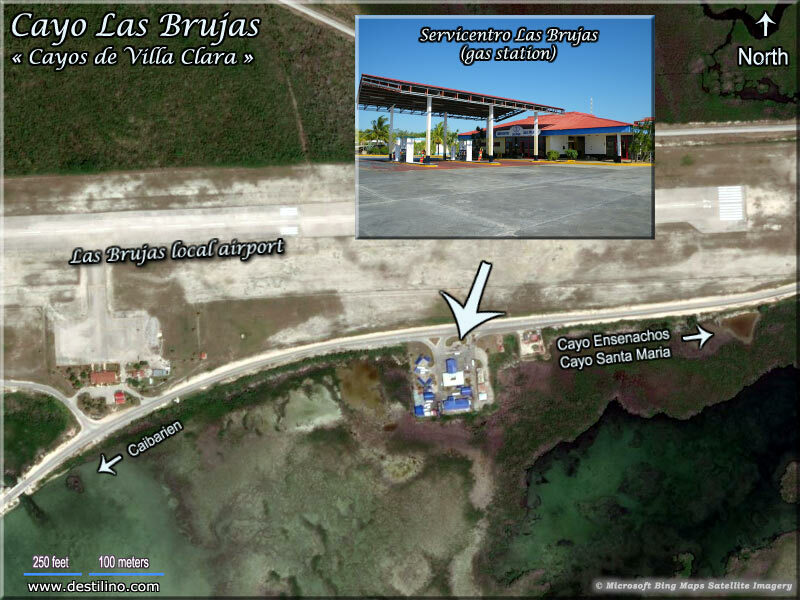 There is only one gas station in the "Cayos de Villa Clara", it's located in Cayo Las Brujas, across from the small domestic airport. Helmets are provided and mandatory. Pay attention when riding on sandy or rocky roads, you may encounter large potholes, rocks, or slippery conditions. Concerning the insurance included in the rental contract: coverage differs from the ones usually offered in North America or Europe. If you are found to be at fault in any way in an accident, the rental agencies will nullify your coverage and seek damages to cover the cost of repairs, which can be very high. Rental agencies are government-controlled and can prevent you from leaving the country unless they receive payment for the damages. If you receive a ticket for a traffic violation, the policeman will write the fine on your rental contract and this amount will be deducted from your deposit when you return the vehicle. If you have an accident in which a third party is injured, you may have to assume full hospital costs for the injured person, and you may be prevented from leaving the country until all legal proceedings related to the case are resolved. Do not drive drunk!, not even a bicycle. Cuba has a zero tolerance policy and in the case of an accident, if alcohol is detected in your blood, you are likely to be presumed guilty. There is only one gas station in the "Cayos de Villa Clara" archipelago, it's located across from the small domestic airport on Cayo Las Brujas, 15 to 20 km from the hotels in Cayo santa Maria. There’s a 2 CUC toll (per car per direction) to cross the Pedraplen (the 48-km causeway connecting the Cayos of Villa Clara to the main island of Cuba). The toll booth is located at the beginning of the pedraplen (Caibarien side). You don't have to pay this toll if you are riding on a tourist bus (airport transfers or tour-bus), but you have to pay the 2 CUC if you are in a taxi, or driving a rental car. Next to the toll booth there's a police checkpoint to control who's in an out the cayos. Tourists (in rented cars or taxis) usually have no problem passing this checkpoint but may have to show their passport.